Michel L. Tremblay, a James McGill Professor and former Director of the Goodman Cancer Research Centre, has been named a Knight (Chevalier) of the Ordre National du Québec, along with his namesake, playwright Michel Tremblay, who was promoted to Grand Officer of the Order. A world-renowned cancer researcher, Prof. Tremblay’s laboratory focuses its work on characterizing the function and regulation of several members of the Protein Tyrosine Phosphatase (PTP) gene family. He has more than 10 patents filed and more than 140 publications in the field of Protein Tyrosine Phosphatases and is a recognized figure internationally on this gene family and their function in cancer, diabetes and neuroscience. Based on his expertise, he served on several boards of biotech/pharma industry companies, two of which he initiated the foundation, and he continues to pursue various research projects in partnership with the private sector. 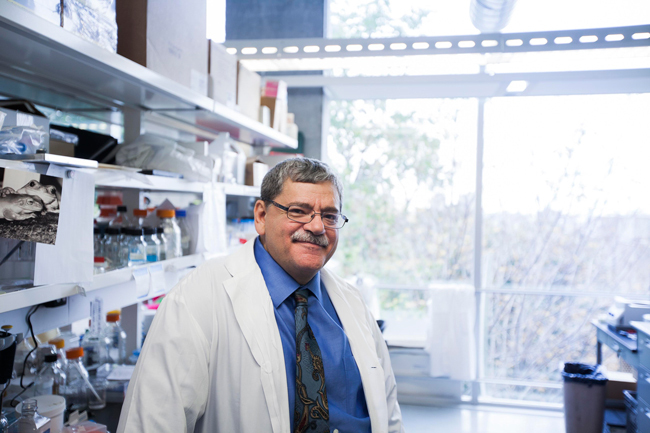 He served as the first coordinator of the Quebec Node of the Terry Fox Research Institute and was member of the Scientific Committee of the Québec Consortium for Drug Discovery. Other honours Prof. Tremblay has received include being named an FRSQ chercheur national; as the Jeanne and J.–Louis Lévesque Chair in Cancer Research and as a Fellow to the Academy of Sciences of the Royal Society of Canada. Prof. Tremblay recently undertook several new assignments, such as; being the secretary general of the International Society of Pathophysiology, and a member of the Advisory Committee on Research for the Canadian Cancer Society. In addition to Prof. Tremblay, three McGill alumni were named in the annual Quebec honours list. They are: Diane Chênevert, BA’82 (Knight), Joanne Liu, MDCM’91, MMgmt’14 (Officer), and Jean-Louis Roy, PhD’72 (Officer).